The socially conscious footwear brand, Toms, has announced a collaboration with the Australian Open, releasing a capsule collection featuring both footwear and eyewear. 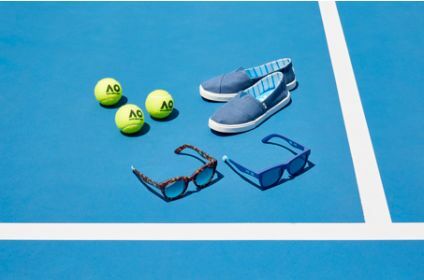 In Toms style, the shoe is a canvas, navy, slip-on, featuring a 'Riviera' stripe in-sole lining, coloured in the 'Australian Open blue' – mirroring the vibrant colour of the court. Over 200 retail staff at the tournament will step out on court wearing the style. Toms CEO, Jim Alling, said that the business is thrilled to be a part of the Australian Open. “Toms is proud to be a part of January’s biggest sporting event in the world. “We are delighted to have a presence at Australian Open 2019 to spread awareness of Toms and the One for One giving movement, on a world stage,” he said. As with all Toms products, for each pair of Toms x Australian Open shoes that are sold, Toms will help a person in need. Toms has been helping Australian children in need since 2016. The Toms x Australian Open footwear is available at the Toms pop-up shop in Garden Square, online and in the Toms retail stores in Collins St and Highpoint shopping centre throughout the Australian Open and retails for $79.95.